Just like Zionism, anti-Semitism and fascism, it becomes unavoidable that Islamophobia must be regarded as a crime against humanity — Turkish PM Recep Tayyip Erdoğan, at a UN summit on tolerance [!] in Geneva. Funny, I have always thought that crimes against humanity were things like the Armenian Genocide, which for some reason Mr. Erdoğan failed to mention. It is difficult for me to see how Zionism, the movement to allow the Jewish people to finally achieve self-determination in their own land, to finally end their contingent existence and subhuman treatment, compares to clubbing Armenian babies to death. And why didn’t Erdoğan mention another ‘ism’, Palestinianism? While Zionism says that Arabs may be citizens of a Jewish state, racist Palestinianism denies that Jews may live in a Palestinian one. Palestinianism calls for the destruction of the Zionist state, while Zionism advocates coexistence. And Palestinianism has been the father of the murderous terrorism that plagues the world today. He did mention Fascism. He could have expanded on this, discussing the relationship between Hitler and one of the founders of Palestinianism, Haj Amin al-Husseini. Husseini incited pogroms in Mandate Palestine, raised an SS division that murdered Jews in Yugoslavia, incited a major pogrom in Iraq, made broadcasts for the Nazis calling on Arabs to kill Jews, helped former members of the SS find sanctuary after WWII, and more. Talk about crimes against humanity! As the story linked above mentions, UN Secretary General Ban Ki-Moon, who was sitting right behind the Turk, didn’t seem to notice anything amiss. Not surprising: the UN, which oozes multiculturalism, seems to draw the line at defending one particular culture, that of Jewish Israelis. There are myriad speeches and resolutions introduced at the UN about the alleged plague of Islamophobia. One would think that Islamophobes are flying planes into Muslim skyscrapers and blowing up their tourist buses on a daily basis. No, not quite. the problem seems to be that “Islamophobes” say nasty things. They say, for example, that Muslims treat women and non-Muslims as inherently inferior, deserving of fewer rights than male Muslims. You see? They are criticizing the religion of Islam and its divinely inspired shari’a! So what if non-Muslims and women actually have fewer rights in Muslim countries? That’s not the important part. And anti-Islamophobia crusaders (oops, bad choice of words!) such as the ACLU are outraged at the New York Police Department’s surveillance of Muslims, actually spying on what goes on in mosques, using informants. Whatever on earth happened to make the NYPD suspicious of Muslims? After all, there have only been 16 Islamic terrorist plots against New York City uncovered since 9/11! Thanks are due to Mr. Erdoğan for creatively illustrating the meaning of ‘crimes against humanity’, and the ACLU for keeping us on our toes about Islamophobia. First, Israel is asked to put its trust in the Obama Administration to deal with an existential threat. Simply, would you take this bet? Second, the US armed forces are stretched extremely thin as a result of the budgeting policies of the administration, and now by the likely sequester of funds. For example, the USS Harry S. Truman, scheduled to deploy to the Persian Gulf this month, will not do so. The US is not in a position to ‘gear up’ for anything major. Third, Obama is said to be offering this to Israel. What will Israel be expected to do in return? I don’t have to tell you, do I? Hint: it involves the Palestinians. Fourth, the demand to ‘remain on the sidelines’ is a direct attack on Israel’s sovereignty as well as an invitation to disaster. When the first Tomahawk hits Iran, Israel will be attacked by Hizballah, which has stockpiled 50,000 missiles for just this occasion, and probably also by Hamas. Iran, too will throw whatever it can against Israel. The policy of ‘no self-defense’ would result in the deaths of hundreds, perhaps thousands, of Israelis. It is as stark as that. And what is the reason for this restriction? There is no American interest served by it — wouldn’t it be better from a tactical point of view for the US and Israel to cooperate? The answer is ugly. This is part of the deal because the Arab world (and especially the Saudis) finds it offensive when Jews dare to raise a hand to Arabs or Muslims. This is why Israel was required to suffer bombardment by Iraqi scuds during the Gulf War, and why it is expected to do nothing when Iranian proxies try to tear it apart. And it is to their advantage in the long struggle to extirpate the Jews from the Middle East when Jewish Israelis die. It is beyond disgraceful that America will be complicit in this. Obama’s policy is Saudi policy. That is where the irrational push to create a Palestinian state comes from, and that is where the handcuffs on the IDF are forged. Netanyahu must tell Barack Hussein Obama to take his promises and go home. Update [27 Feb 1901 PST]: Added the link after “Second” to J. E. Dyer article “Dead in the water: Obama’s military and the Iran nuclear threat.” I am not a military expert, but Dyer is. Rewrote last few paragraphs of the post for clarity. 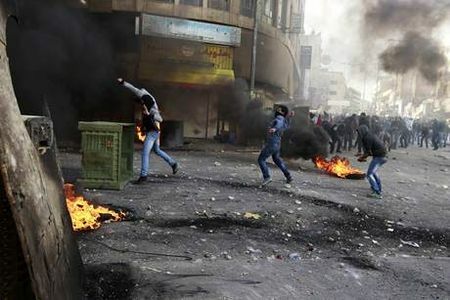 Today there were riots in Judea and Samaria, as Arabs protested the death of a prisoner held in Meggido Prison, Arafat Jaradat. Israeli authorities said that an autopsy, carried out in the presence of a Palestinian doctor, did not show signs of torture. The Palestinian Authority claimed, on the other hand, that there was evidence of bruises and broken ribs. Israel said there were rib fractures but they could be attributed to attempts to resuscitate Jaradat. No cause of death could be determined. The usual suspects — Amira Hass of Ha’aretz, +972 magazine, etc., — all insist, with zero evidence except their hatred of the Jewish state, that he died as a result of torture. Further tests will be carried out, but the actual facts will not change the opinion of 99% of the people on either side of the issue. Let me translate this apparently Gandhian remark: Arabs are encouraged to engage in disturbances in which they will throw rocks and launch them from powerful slings at Jewish soldiers and civilians. They may also try to tear apart any of the unwary that they get their hands on, and they may throw homemade firebombs. They will do their best to place security forces in the position that they must use force to defend themselves. The use of actual firearms and explosives, if such occurs (it will), will be attributed to members of extremist groups that the PA and Hamas do not control. Shootings and bombings will be deplored, but ‘understood’. It is also important to understand the rationale and the goals of these disturbances. They are currently focusing on the ‘prisoner issue’, that is, the presence of Palestinian Arabs in Israeli jails for security-related offenses. Although many, including murderers, were released in trade for Gilad Shalit, Palestinians continue to engage in terrorism and continue to get arrested. From the Arab point of view, this is insufferable: first, because any anti-Jewish activity is considered resistance to occupation and therefore is justified; and second, because they do not recognize the authority of the Israeli ‘colonialist’ government to arrest Arabs, whom they view as the indigenous owners of the land. The release of prisoners is one of the PA’s preconditions for negotiation with Israel, along with stopping construction in the territories and eastern Jerusalem. But why heat things up just now? Abu Toameh and other commentators have suggested that it is because of the impending visit of Barack Obama to Israel. Although Obama himself hasn’t said much about it, there are indications — particularly from the new Secretary of State, John Kerry — that a new push for an Israel-PA agreement is in the offing. But creating an independent Palestinian state soon would be the worst possible way to “ensure Israeli security!” It’s hard to imagine what logical process went on in Kerry’s head to make this statement possible. Perhaps the Palestinians do understand whatever drives the illogic of this administration. There will be another intifada; Palestinians will ‘suffer’ even more at the hands of Israel (nobody will talk about Syrians and Egyptians suffering far worse travail at Arab hands); it will be demanded that the US “do something” to “control Israel,” which is preventing “peace” by its intransigence. Barack Obama will bravely step in to take the political risks necessary to once and for all save Israel and the Palestinians from each other — which he will do by forcing more concessions from Israel, yet again. Of course it won’t fly, not easily, because Israeli leaders understand the consequences of another terror state a few miles from its population centers. Aren’t there other issues that Obama could focus on that are closer to American interests and more likely to bring success? On contemplating the team Barack Obama has picked — Hagel, Kerry, Brennan — especially on a day like today, which happens to be Purim, one wonders if the supposedly ‘paranoid’ among us could possibly be justified in thinking that one of the very highest priorities of this administration really is to screw Israel? I’m going to devote today’s post to one of my least favorite humans, George Galloway. My U.K. readers already know probably more than they want to about him, but it occurred to me that others, Americans in particular, don’t know who or what he is. So I’ll do my best to remedy that. Galloway, 58, is a member of the British Parliament for Bradford West, located in Yorkshire in north-central England. He was elected in 2012 by a landslide, receiving 56% of the vote; his nearest competitor got only 25%. Galloway, formerly a garden-variety leftist, was kicked out of the Labour party in 2003 because of his aggressive attacks on Tony Blair over British participation in the Iraq war. In 2004 he joined a new left-wing party called “Respect,” which he and his faction shortly came to dominate. Galloway was the first MP elected by Respect, whose official ideology seems to be a sort of leftish populism. Galloway has made it more than that, adding elements to appeal to Muslims (Bradford West was 38% Muslim in 2001, and is probably much more than that now). The party began to downplay some of the traditional left-wing causes like women’s and gay rights, while emphasizing opposition to the wars in Iraq an Afghanistan. Galloway himself may have converted to Islam (he is coy about this, perhaps to keep the few non-Muslim working-class votes that he receives). But he makes no pretense about appealing to Muslim interests — and prejudices. What distinguishes Galloway from other many other demagogues — even in the UK — is his particularly vicious hatred of Israel, which extends to support for the Jew-hating Hamas. In 2009, he played a leading role in the “Viva Palestina” convoy to bring ‘aid’ to Gaza, which resulted in his being deported from Egypt. He often speaks against Zionism and Israel on his several radio/TV programs — in the UK, on a satellite channel linked to Iran and Syria in Lebanon and the US (on Pacifica station WBAI New York). Hizballah, too, meets with his approval. “Hizballah is not and has never been a terrorist organisation. It is the legitimate national resistance movement of Lebanon,” he tells us. Ideology isn’t important as long as someone wants to kill Jews. Galloway is always good for a rousing stump speech on the evils of Zionism and that “little Hitler state on the Mediterranean.” Just search for him on YouTube. 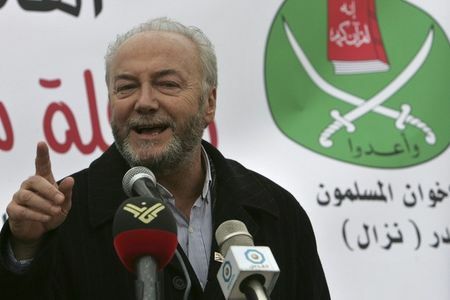 In short, Galloway is a man who has built a political persona and a career on hating Israel. Since explicit racial or ethnic hatred for groups of people is unfashionable — at least, in some parts of the West, although it is making a comeback — he must focus on abstract objects of hatred, like Zionism and Israel. His supporters aren’t deceived, and neither am I.
Galloway’s latest thuggish expression of hatred came with very little provocation. In response to an Oxford student who called for a peaceful, mutually agreed upon two-state solution, he suddenly asked “are you Israeli?” When the student answered in the affirmative, Galloway announced that he doesn’t debate Israelis, he doesn’t recognize the state of Israel, and stomped off — followed at a respectful few paces by his wife. The replacement of dictator Hosni Mubarak with the Muslim Brotherhood’s Mohammed Morsi has had serious negative consequences for Egyptian liberals, Christians, and women; for Israel, which now must treat Egypt as a hostile power rather than a peace partner; and for the US, which is in the uncomfortable position of financially supporting a radical Islamist, anti-American, antisemitic regime. So did this have to happen? Some say yes, there was no way the 82-year old corrupt, brutal Mubarak could have been propped up (but note that the new regime is no less, possibly more, brutal and corrupt). And shouldn’t the Egyptian people be allowed to choose their own rulers? Immediately after Egypt’s presidential elections in June 2012, Eitan spoke to unnamed local officials, who told him that with a mere 5,000-vote advantage for Islamist candidate Morsi, the military was prepared to announce the victory of his adversary Shafiq, a secular military man closely associated with the Mubarak regime. But secretary of state Hillary Clinton, Eitan said, decided to favor democracy at all costs and disallow any falsification of the vote. If you believe that the ideology of radical Islamism represents a real challenge to the Enlightenment values of Western civilization, then the takeover of the largest and most important Arab nation by the Brotherhood is a significant defeat for America and the West. Although historical analogies are notoriously misleading, in a sense it is as if the US had intervened on behalf of the Bolsheviks in 1917 or helped Hitler attain power in 1933. The appeal to ‘democracy’ is particularly ludicrous. Although Morsi uses the word a lot, his actions in consolidating power in the hands of the Brotherhood have been anything but democratic. And the philosophy of the Brotherhood itself makes it clear that regardless of the means by which power is attained, the goal is a state — and ultimately an expansive caliphate — governed according to shari’a, ruled by religious authorities, a regime in which Muslims (male) will dominate all others. It seems that the Obama Administration has made a distinction between Islamists, with al-Qaeda and Hizballah in the category of ‘bad’ Islamists because they have directly attacked us, while the Brotherhood and (for example) the Turkish AKP are ‘good’ because they have made the tactical decision not to wage war on us (at least not yet). But their ideology is no less anti-Western and anti-American. If Eitan’s analysis — that the US chose to support Morsi because it would be ‘more democratic’ — is true, it reveals a shocking ignorance on the part of our leaders about the nature of the Brotherhood, of Egypt, and yes, the real meaning of ‘democracy’.